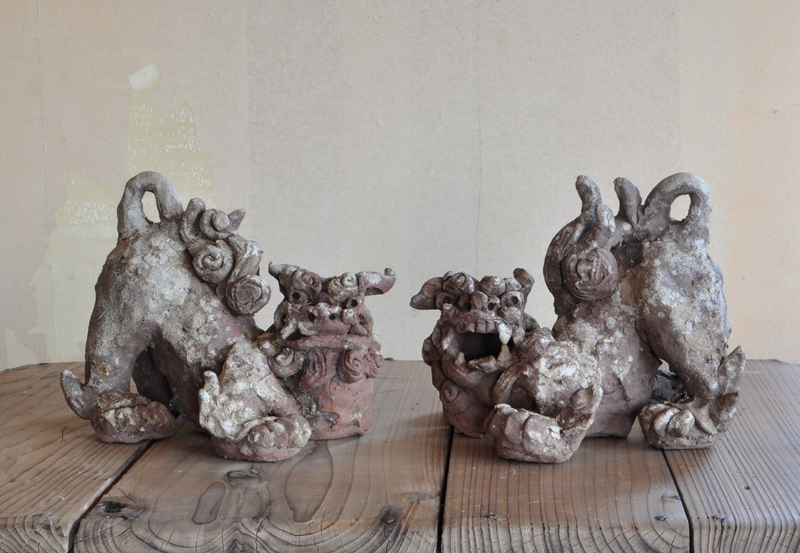 SHISA (Dealer: hotoke antiques) – Lovely pair of Ryukyu terra-cotta pottery ‘shisa’ lion statues as traditional Okinawan talisman placed at the gate to house actually. 20th century, Okinawa region. The open mouth shisa wards off evil spirits, and the closed mouth shisa keeps good spirits in, as ‘a-un’ (inspiration and expiration, or alpha and omega) relationship. Quite a rare old type, but sort of fragile make as originally, since bonding each parts (face parts, legs) to form its whole body as the structure. In well-used condition as is, with such wabi weathered texture stuck with slight moss as seen.